Volunteers can complete the questionnaire anywhere and at any time. This is much faster than the traditional sidewalk survey in which a surveyor takes photos and subjectively grades a property as good, fair, or poor. On the city side of the app, managers have a dashboard. A gauge shows the number of surveys completed. Bar charts show the number of problem types reported such as damaged roofs. A color-coded dot indicates parcels that have been surveyed. Click on the dot and see the property. By panning over the city, the user sees structures with code violations and even clusters of issues that may indicate a trend. 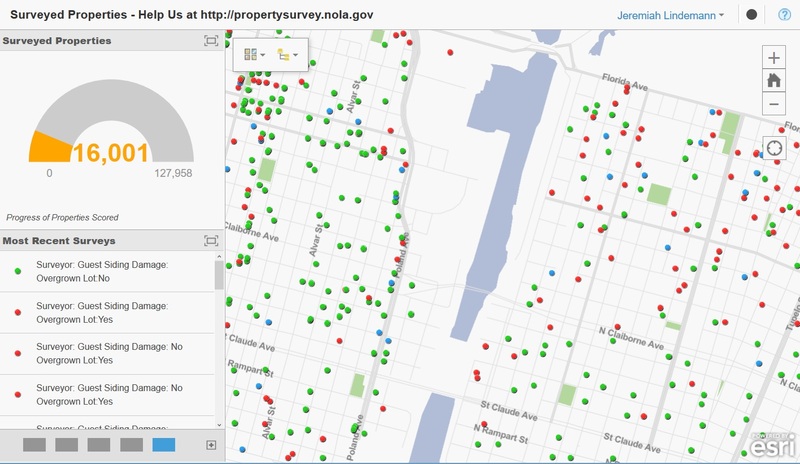 Esri Crowdsource Manager solution includes configurable group app templates resources and templates that ArcGIS Online subscribers can download and configure to help them put together public facing solutions that increase community engagement.